Vampire Diaries in Season 2 has enough love triangles and romances to keep any ‘Shipper (people who are fans of a certain relationship) extremely happy. They put together a lot of couples that I couldn’t really see together and some that we were pretty positive would fall apart quickly. Of course, the main lovers triangle is our lead female Elena and the vampire brothers Stefan and Damon. It’s no deep mystery that I love Vampire Diaries mainly for Damon, the smoldering hot Ian Somerhalder was one of my favorite actors on Lost and he still brings the charm — in a very vulnerable bad boy way — to CW’s Vampire Diaries. Damon reveals in the second series that he loves Elena, but for most of the series it’s clear that Elena is conflicted and, despite a moving moment in the finale, it’s still unclear if her love is deep enough to last. Rooting for a particular relationship is part of the fun for a lot of fans. Unrequited love, portrayed love, even couples that were together and broke up still have fans who root for them to get back together and for the world to be right again. So here I go rooting for the couple I’m sure is doomed to fail. I’m also a fan of Jeremy Gilbert & Bonnie Bennet. Bonnie seems to not quite fit in any other pairing I can see (though those who suggest Bonnie and Damon just make me laugh). So glad Jeremy’s character grew up this last season. How about you? Who are you rooting for in Season 3? 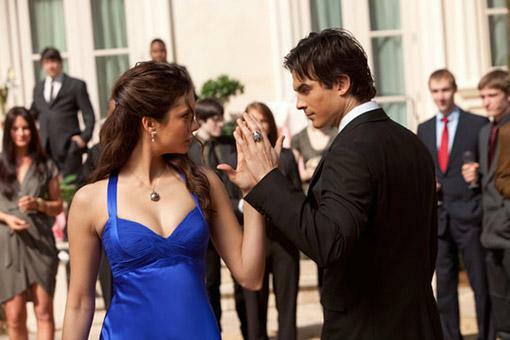 Watch it all again by pre-ordering your copy of The Vampire Diaries: The Complete Second Season on DVD/Blu-Ray here today: http://bit.ly/mkiZtx ! Along with some great characters and stories the writers also do an awesome job with the pacing of the show. Things never slow down. Edge of your seat all the time. It might be the best paced genre show on TV right now. I was dubious when I first started watching, but I’ve grown to really enjoy the drama. I think the second season really picked up a lot from the first. I started watching the first season and gave up after 3-4 episodes because it was so teen angsty. However, a couple of friends who I trust said to stick with it since it gets much better around the fifth episode. So glad I went back and gave it a second chance.